We knew the mountain crossing from Ibague to Armenia takes roughly three hours, so we got up early today and hit the road at a respectable time. We were on the bikes shortly after 8AM, stopped for breakfast and gas and got really “on the road” at 9. 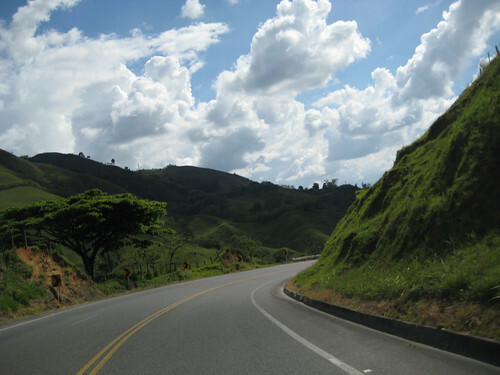 Made good time to Ibague and found a road that bypasses it so we wouldn’t have to go through the city. But it was starting to drizzle. Or rain. We stopped to put liners on our top half and cover our tank bags, and I commented that if we happened to pass a gas station, I could probably use a bathroom before our endless trek over the mountains. Ask and ye shall receive! Gas station with bathroom. The rain was coming down harder now, and I didn’t want sloshy boots, so I decided that while we were stopped, I’d put the leg liners in my pants. Which involves taking the boots off, the pants off, zipping the liner in, putting pants back on and putting boots back on. It sounds like a PITA but normally it’s not this bad. The bathroom was small. Like tiny. Built for children. I had to take off my Camelbak and turn sideways just to fit through the stall door, and I had to straddle the toilet while messing with the boots and pants because there wasn’t room for me to stand/put my legs in front of me/etc. So I put the liner in quickly, zipped it in, went to pull the pants on and… my right leg won’t go through. What? That’s never happened before. The leg must be twisted, but I had no idea it would prevent my leg from passing through entirely if that happened. So I take the pants back off and go to unzip the right leg, and get about halfway around before the zipper won’t budge anymore. One single tooth didn’t get zipped properly when I put the liner in – it’s out of line with the other teeth and sticking kinda sideways – and I can’t get it to unzip anymore. I fuss with it for a few minutes before calling to Kay through the headsets; handy that we were both still wearing our helmets. I ask for a Leatherman to tackle the zipper, but there’s a catch – I’m in the women’s bathroom and I’m literally stuck in the stall. And Kay can’t come in because of social restrictions and because the door is locked. We argue about it for a few minutes before I realize I can stick my hand out the stall and reach the door to the bathroom, and get the Leatherman from Kay. Grab the zipper with the pliers, give it a good yank and it unzips like nothing was ever wrong. Yay for Leatherman! Get the leg liner in the right way, and with much grunting and whimpering about the confined space, I manage to get my pants back on, boots on and boots buckled. All told, this little episode had me in the bathroom for something like 20 minutes, what with the zipper difficulties. The guys who were standing around were probably snickering about it. Kay went to put his leg liners in, and got it done with much less drama thanks to a much larger stall. Back to the bikes… and the rain has slowed down. In fact, it’s nearly stopped. But liners stay in, and on we go, across the mountains. We encountered fewer trucks in the first stretch than we did last time, which I suspect is because of the rain. A bunch of trucks were stopped at the gas station and I think they were waiting the rain out – it’s a steep, slippery, twisty road that ascends and descends 3300 meters in the span of about 30 kilometers and I imagine the smart truckers don’t take chances. Made it up the easy part of the road in good time and spotted a bank in the tiny town before the steep part of the ascent starts, and stopped to try to get cash. Unfortunately, the bank we spotted wasn’t finished yet (they were building it) but a guy pointed out another bank that we drove right past which had an ATM. Alas, it didn’t like our debit card. Kay pondered taking the jacket liner out, but it started raining again while we were checking ATMs (because at this point we had about 4000 pesos to our name, or about $2 US) so we just got back on the bikes and headed up the steep part of the ascent. It was just as steep as we remembered from last time, but we seemed to have better luck with the trucks. We only got stuck behind trucks a few times, and were able to safely pass on the left with a little patience each time. When we broke out the top of the pass we saw sunshine, which felt wonderful! But back down the other side of the pass, we passed back into clouds and drizzle. In all, though, we made better time crossing this time – only two hours from Ibague to Armenia instead of the three it took us last time. Heading up toward the top of the pass, though, the road was wet from rain and the moisture of the clouds, and at one point, Kay’s back end slides out a bit. Not enough to drop him, but enough to cause a wibble and a bit of panic. That’s when I notice the rainbow-colored tracks in the water on the road. “Someone’s leaking oil!” Kay calls out, and we now have an ongoing oil slick to contend with on this steep twisty mountain road. We try to ride outside of the slick as much as possible, and keep our bikes going forward at a steady pace as much as possible, and hope we don’t have an off. Eventually we come around a corner where there’s a gigantic pool of oil under a car and a guy poking it from underneath and a guy standing there staring at it and scratching his head. He lost oil for probably a kilometer, but after the pool where he finally stopped, no more oil on the road. Which was a bit of a relief for both of us. Quick side trip to Armenia to find an ATM so we could get lunch, which still didn’t like our debit card, but Kay used his personal debit card and was able to get cash. No idea what’s going on with that. We’ll have to check on that account when we have internet, and I’ll have to try my card next time. Rode out of Armenia and stopped at one of the many restaurants that litters the roadside of the Pan American highway through Colombia (in a good way – we’ve stopped at a few now and they’ve all been delicious). Had a lovely lunch, and a bit of a chat with the waiter who spoke some English. He had enough English to ask us some questions about the bikes, which we answered in a combination of English and Spanish. It was fun. Hit the road again and head toward Cali. And at lunch, we took a chance and removed the rain liners from our pants as well as our jackets. Which, of course, invoked Murphy – we had some rain spatters leaving lunch, and when we were getting close to the turn off for Cali, we encountered some more serious rain. We stopped to put on the rain covers for our tank bags, and Kay put on the rain liner in his jacket, but I was hoping the road would curve right instead of left and we wouldn’t hit the rain. So I took a chance and left my jacket liner off. Wrong move. We hit rain almost immediately, but it was short-lived. We rode out of the rain, but we could see deeper black ahead, and I started seeing lightning strikes. It was obvious at this point that the road was heading right toward it, so I asked to stop again so I could put on my jacket liner. Should have just done it when Kay did. Forward again, and into an intense downpour. Which soaked us in a few seconds flat, but didn’t even last as long as it took us to stop and put in the liners. 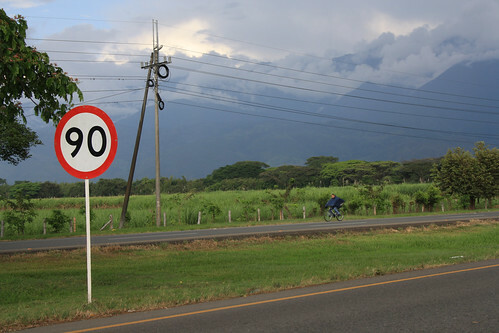 After riding through the rain, it was smooth sailing on a nice highway with speeds of 60MPH! We thought we’d make some good forward progress and get dry. It became apparent that we’d hit Cali around 4PM. 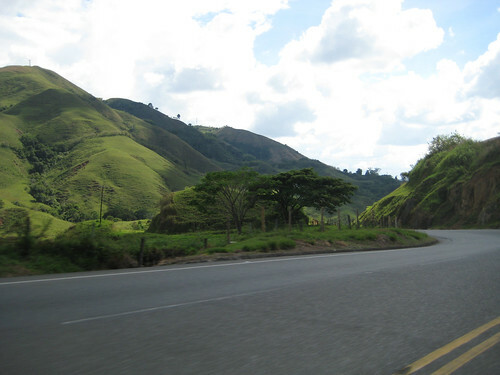 I had no desire to waste time going into the city again to stay at Casa Blanca Hostel, and then loose time getting out of the city in the morning, so when I saw a road that bypassed Cali for Popayan I asked Kay if we could just skip Cali and keep going. He agreed, but expressed concerns that we wouldn’t find somewhere else to stay. We rode. And we rode. And we rode some more. Just when we were starting to get dry, we rode into another downpour which soaked us again. We thought the worst of the clouds were behind us and had no inkling we were about to hit another rainstorm, but we rode right into it with zero warning. So we were soaked again, and it was 5PM, and we were over 100KM from Popayan but had no idea where to stay. At this point we just kept riding, hoping we’d see a hotel on the side of the road. We’d found some good spots for camping in the valley near Cali (although it stunk there) but that was far behind us, and the road got hilly and twisty with no more good camping spots. As the sun started to go down, the temperature dropped, and we were getting chilly and then outright cold in our wet gear. Just when sunset was imminent and we were about to have to ride in the dark, we hit a service station and Kay spotted a “hostel” sign in the plaza. Kay pulled in and suggested we check it out, so he did, and it turns out it’s a nice, clean, modern facility with private bedrooms and bathrooms for around $7 US. We got a room, unloaded the bikes and grabbed dinner in the restaurant in the plaza. Dinner came with the obligatory Colombian soup, which was delicious to our cold, damp selves – and we count ourselves lucky for this bounty at the day’s end. Also? They had Diet Coke. 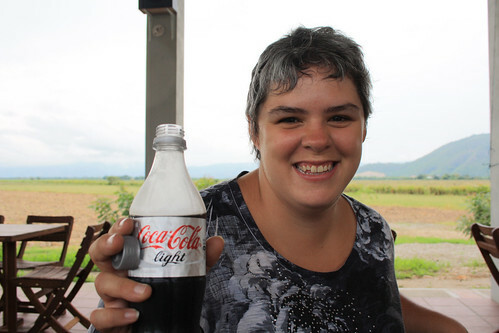 Every restaurant today had Diet Coke. I had it with breakfast, lunch, and dinner. I haven’t seen Diet Coke in ages so I’m really excited about this. It’s been a good day.